Gielle FM200 systems are based on many years experience in the design, supply, installation and commissioning of gaseous fire fighting systems. During this time Halons have provided industry and commerce with a unique and versatile extinguishant to respond to most fire protection needs. The Montereal Protocol presented the fire protection industry with a most demanding challenge - to find a replacement for Halons. Gielle evaluated a large number of candidate agents over several years before selecting FM200. FM200 (HFC 227ea) is known chemically as Heptafluoropropane. FM200 is a colourless gas which is liquified under pressure for storage. Like Halon 1301 it has a low toxicity level and is superpressurised with Nitrogen to 24.8bar (360psi). It rapidly extinguishes most commonly found fires through a combination of chemical and physical mechanisms. FM200 contains no bromine or chlorine and therefore has zero Ozone Depleting Potential (ODP). The atmospheric lifetime of FM200 is between 31 and 42 years which along with its zero ODP presents a long-term solution to fire protection requirements. FM200 has been found to be less toxic than Halon 1301, which makes it safe for use in the fully automatic mode in occupied areas. Typically FM200 requires a design concentration of 7%, which is well below the 9% No Observable Adverse Effect Level (NOAEL) on cardiac sensitisation. The NOAEL for Halon 1301 is only 5% (the same as its design concentration). traditionally protected using Halon 1301. It is effective in the protection of data processing, telecommunications and electronic equipment as well as most flammable liquids and gases. Existing Halon and CO2 control systems meeting the requirements of the relevant national or international standards are ideally suited for use with FM200 and can be modified to operate as part of an FM200 system. Due to the differences in concentration and physical characteristics between the gases it will be necessary to change the container valve and nozzles and probably the pipework and storage containers in carrying out a retrofit of an existing system. However, due to the similarities in the equipment, changing from Halon or CO2 to FM200 can be accomplished with minimal disruption and little or no system downtime. Compared with Halon 1301, FM200 systems require minimal additional floor storage space, if any. The physical properties of FM200 together with its efficient extinguishing capabilities allow it to be used in similar types of equipment to Halon. As the extinguishing abilities of FM200 determine that only 70% more agent by weight is required, the demands for additional storage space requirements are minimal. Gielle has invested in Halon recycling facilities and is able to decommission existing systems in an environmentally responsible manner. Room Integrity Testing has become an important feature of the commissioning of gaseous fire fighting systems. The Integrity Test is performed to check that rooms can maintain a sufficient extinguishing agent concentration for the required holding time. Room Integrity Testing can also be included as part of servicing agreements and is very strongly recommended on new installations. Gielle have a dedicated Extinguishing Systems Service Team operating nationwide. Contact is provided through our area offices which operate a 24-hour, 365-days-ayear emergency service network. We are able to carry out routine maintenance on all Gielle and third party extinguishing systems and are able to offer advice to our clients on the statutory requirements of the Pressure Systems and Transportable Gas Containers Regulations. We can carry out the work required under the above regulations such as the periodic inspection of containers, in most cases without system downtime. With our modern filling plant we are able to refill all Gielle and most third party containers. 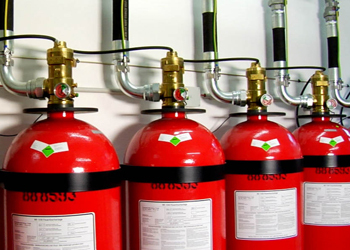 Quality Assured As a leading fire protection company with operations in the USA, Europe, the Middle East and Asia, the Extinguishing Systems operation, including comprehensive filling, testing and distribution facilities. 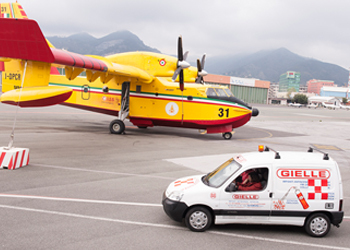 FM-200, a trusted choice in waterless fire suppression, is now a member of the Gielle family of clean agent fire extinguishant systems. FM-200 is accepted and respected worldwide, with a history of protecting some of the world's most critical and irreplaceable assets. In fact, FM-200 is in use in over one hundred thousand applications, in more than 70 nations. Many fire suppression systems can cause major damage to – and even destroy – the very things they are supposed to protect. You're looking to avoid damage – not cause it. You're looking to reduce downtime – not lengthen it. You want a fire suppression system that deploys quickly and cleanly and won't leave behind oily residue, particulate, or water. FM-200 fire suppressant stops fires fast. When you consider the potentially devastating environmental effects of an uncontrolled fire, it's easy to see that an FM-200 system is an important part of an environmentally responsible fire suppression solution. FM-200 fire suppressant can be safely used where people are present. 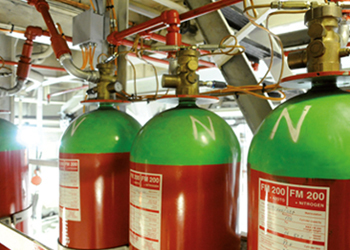 In applications where space is at a premium, FM-200 fire suppression systems are the superior choice. The FM-200 agent is stored in cylinders as a liquid and pressurized with nitrogen, saving huge amounts of storage space. In fact, for the same amount of protection, FM-200 systems take up to seven times less storage space than systems based on CO2 and inert gases. You cannot afford to settle for minimum fire protection when lives and valuable assets are at stake. There's no substitute for genuine DuPont™ FM-200 waterless fire protection. HFC-227ea fire suppression agent is an acceptable replacement for Halon 1301. HFC-227ea has a zero ozone depleting potential, a low global warming potential, and a short atmospheric lifetime. It is particularly useful where an environmentally acceptable agent is essential, where clean up of other media presents a problem, where weight versus suppression potential is a factor, where an electrically nonconductive medium is needed, and where people compatibility is an overriding factor. Examples of typical applications are: Data Centers, Electrical and Electronic Equipment Rooms, Telecommunications Facilities, etc. HFC-227ea is an odorless, colorless, liquefied compressed gas. It is stored as a liquid and dispensed into a hazard as a colorless, electrically nonconductive vapor that is clear and does not obscure vision. It leaves no residue and has an acceptable toxicity for use in occupied spaces at design concentrations (approximately 5.8-7% by volume). HFC-227ea extinguishes a fire by a combination of chemical and physical mechanisms. HFC-227ea does not displace oxygen and therefore is safe for use in occupied spaces without fear of oxygen deprivation. The minimum design concentrations should be in accordance with NFPA 2001 (Standard on Clean Agent Fire Extinguishing Systems). Fm-200 is the clear choice for a fast, clean fire protection agent. Introduced as a Halon replacement in 1993, it quickly gained acceptance as the world’s leading clean gaseous fire extinguishing agent. When it comes to fire protection, there can be no compromise. Fm-200 extinguishes fire via a combination of chemically based fire inhibition and cooling. It is environmentally acceptable, safe to use with sensitive equipment, fast-acting, efficient and effective. When it comes to fire protection there can be no compromise – contact us to day to learn more about our FM-200 system solutions.